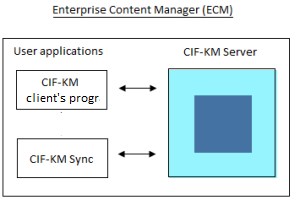 CIFKM is an Enterprise Content Management (ECM) for the management of structured information, documents, emails, contacts, discussions, negotiations, drawings, graphics, etc. Its objective is not editing of documents, but in its most basic form it is the replacement of traditional filing systems, but with the advantages of modern technology. CIFKM Sync is a complementary application of CIFKM application. Its purpose is to synchronize automatically and bidirectionally selected files and folders by the user, between his working devices (PC, tablet, ...) and CIFKM server. Both, CIFKM manager and CIFKM Sync. are installed at the user's PC as client programs. Thus, every user (even offline) is able to work at CIFKM content using all the applications and tools available at his personal working device. As soon as his device is hooked up to Internet, the outcome of his work will be automatically synchronized with the CIFKM server. Thus, user finds convenience and the enterprise, thanks to synchrony, keeps the content of CIFKM server updated, which supports the whole company's organization. For working with CIFKM Sync it's not necessary to open CIFKM manager neither to have it installed, although usually both programs will be installed simultaneously. Any user can have his account of CIFKM Sync (name + password or login) registered in several PCs, so that this will appear in the CIFKM Sync_(followed by his user's ID) folder of each PC as well as his synchronized Data Smart Boxes of CIFKM (hereafter as DSB) and their synchronised files and folders. Any DSB can be fully or only partially synchronized. You, as user, can have their own CIFKM Sync account (login name and password) registered in several PC, thus at all of them your Sync folder _ CIFKM (...) will appear (followed by your identity) with all your synchronized files and folders of Data Smart Boxes of CIFKM (hereinafter DSB). In turn, in the same installation "CIFKM Sync" in a unique PC, multiple user accounts can be registered with their corresponding "CIFKM Sync _ (...)" folders, each one with their own synchronized files and folders. However, at a given time there can be only one user logged-in. Thus, the user can work at his CIFKM Sync (...)- folder at every PC in which his account is registered. Changes in one PC will be immediately synchronized into the server as well as into any other PC. Removal of the account in one PC will not affect the others with the registered account. User has offline access to his sync. files and folders at his working devise. Thus, every user (even offline) is able to work at CIFKM content using all the applications and tools available at his personal working device. User can use" My Documents" folder of CIFKM Sync_(...) as his private synchronized back-up. User has access to synchronized files and folders via web-browser at any mobile or stationary device and upload changes. Via web-browser one can't synchronise new DSB, but he can add/modify/delete files and folders of already sync ones. The Company becomes more efficient and profitable because the waste of time for archiving, keeping, finding, and retrieving information is considerably reduced. When registering a user's account in a CIFKM Sync application installed in the user's PC, a folder, called "CIFKM Sync_ (account name of user)" devoted to keep his synchronized DSBs, files and folders, is automatically created, with the user's identity in CIFKM. After, user may shortcut it by the icon which may be found in the menu of CIFKM Sync. icon at PC's taskbar. 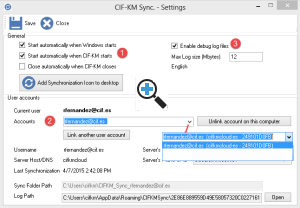 The folder Sync _ CIFKM (...) is synchronized with CIFKM server only when the client program CIFKM Sync is open and it has connection to Internet . Then, all offline pending changes will be synchronized. Only files and folders that are stored, either in a DSB folders, represented by the icon or in "My Documents" folder represented by the icon will be synchronised with CIFKM's server. On the contrary, any file or folder added to the folder CIFKM Sync_(...), but out of the above mentioned folders, will not be synchronised; for them CIFKM Sync_(...) folder behaves just like any other folder in the PC. If CIFKM's client program is open, via the options menu of CIFKM. Then, CIFKM Sync will start under the user ID of CIFKM. Automatically according to configuration of the CIFKM Sync . Thus, it can be configured so that when PC starts, CIFKM Sync starts too remembering the last user's login. CIFKM Sync is currently activated, but no user is logged in. CIFKM Sync is currently activated and a user is logged in. CIFKM Sync is currently activated, but server connection failed. CIFKM Sync is currently activated, but sync on certain files failed due to version conflicts. CIFKM Sync (...): PC's folder where the sync DSB, files and folders are shown. Configure CIFKM Sync: It shows the settings of CIFKM Sync. Only partial synchrony. Only some files and folders of the DSB- folder are synchronized and the process is ready. "My Documents" folder with sync process ready. "My Documents" folder wich sync process isn't yet ready. Folder in a DSB in full synchrony which sync process is ready. Folder in a DSB in full synchrony which sync process isn't yet ready. File in a DSB which sync process is ready. File in a DSB which sync process isn't yet ready. File in a DSB which sync process is ready and it is permanently locked by the current user or somebody else. File in a DSB which sync process is ready and it is temporarily locked by the current user or somebody else. A user with sync items in a DSB visualises a label in the upper left side of the window of the DSB at CIFKM. The label shows whether it is either fully or partially synchronised. Other users that don't have any synchronised item on this DSB don't visualize any label regarding the synchrony. Fully synchronized. It indicates that that the user has all the files and folders of the DSB synchronized in the PC at CIFKM Sync (...) folder. Partially synchronized.. It indicates that user has only some files and folders of the DSB synchronized in the PC at CIFKM Sync (...) folder. Total sync of a DSB doesn't show any icon at the items as all are sync. On the contrary. in partial synchrony of a DSB sync files and folders show their sync status on the window of the DSB, as follows. Single sync file in a DSB. Folder fully sync in a DSB. Folder partially sync in a DSB because the user has only selected some files in it for being sync. He hasn't selected the whole folder for sync. Sync file permanently locked by the current user or somebody else. sync file temporarily locked by the current user or somebody else. 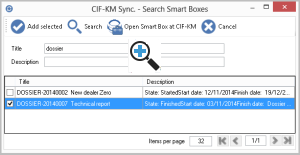 7.4 icons showing the sync DSB in the lists of "Recent Smart Boxes" and "search results"
Sync Manager is one of the menu options of CIFKM Sync that opens a user's window for management of the synchrony (it shows management functions that aren't implemented in CIFKM Sync_(...) folder as the latter is an ordinary Windows folder). - It shows a shorcut button to open, at CIFKM application, the selected DSB. - You can open DSB from the list by clicking over them, access and modify its sync content (folders and files). - You can search already existing DSB and sync them. - You can create new DSB that will be automatically sync. - You can desync listed DSB. Update. It refreshes the list of synchronised DSB. Add existing DSB. It opens the search window of DSB enabling to find and select DSB for being synchronized. Create New DSB. 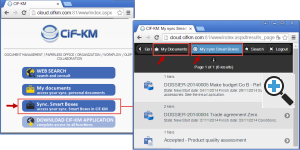 Shortcut to New DSB window of CIFKM application which once created will be automatically sync. Open DSB in CIFKM. It opens the window of the selected DSB in CIFKM. desynchronization. Removes sync of a chosen DSB. Open local folder. It opens the DSB in CIFKM Sync_(...) folder where the synchronized files and folders of the user are displayed. It opens a window for user's account configuration at CIFKM Sync. Events that open CIFKM Sync automatically. CIFKM Sync registered Accounts. The accounts of registered users at CIFKM Sync of the PC are shown in a drop down list. In the same PC can be registered several users. Every registered user of the drop down list in the CIFKM Sync of the PC has his own login (name and password) and there is his CIFKM Sync_(...) folder that contains his sync files and folders. These are buttons for searching, adding or removing user accounts from CIFKM Sync, respectively. When a new user account is added, his CIFKM Sync_(...)- folder is automatically created and sync of his sync files and folders starts. 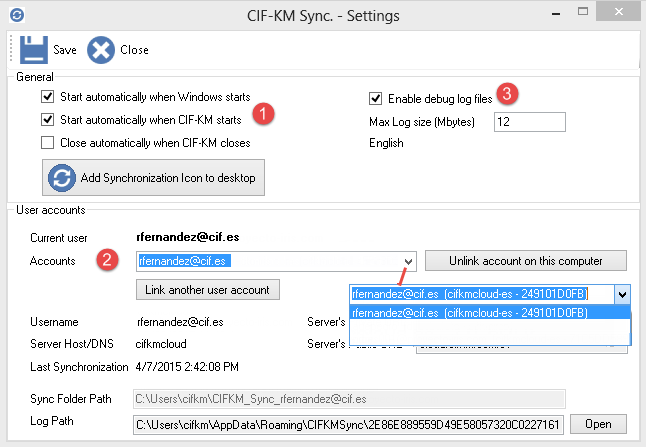 If a user account is removed from CIFKM Sync, its synchronized files and folders are too removed from the computer; but any other device with the same account registered in its Cifkm Sync App will not be affected by this operation. 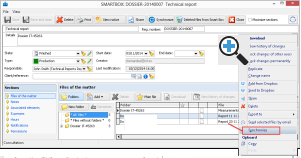 It shows a log of all operations made in the sync processes. It helps to localise errors. On the middle of the upper button bar of a DSB window there is the button for full sync or desync. If you select folders and files at the CIFKM window of a DSB you can "synchronize" them using the right- click button of the mouse, choosing the option "Synchronize". If it is a folder what is chosen for being synchronized, then its whole content will be synchronized. 12. Full sync of DSB at "Sync Manager" of "CIFKM Sync"
From the window "Sync Manager" of CIFKM Sync (see point 8 above) you have to choose the DSB and add it to the list of synchronized DSB. 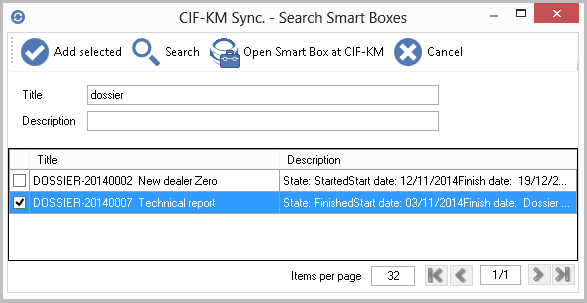 Clicking over the button "Add existing Smart Boxes" at the "Sync Manager", a window for searching and selecting DSB from CIFKM pops up . The selected DSB from the resulting list may be added and synchronized by clicking over "Add selected". Clicking over any DSB of the list at "Sync. Manager", the corresponding DSB of "CIFKM Sync, (...) folder will open, showing its sync. files and folders. (1) CIFKM Sync Manager (point 8 above). (2) CIFKM Sync_(...) folder (point 4 above). 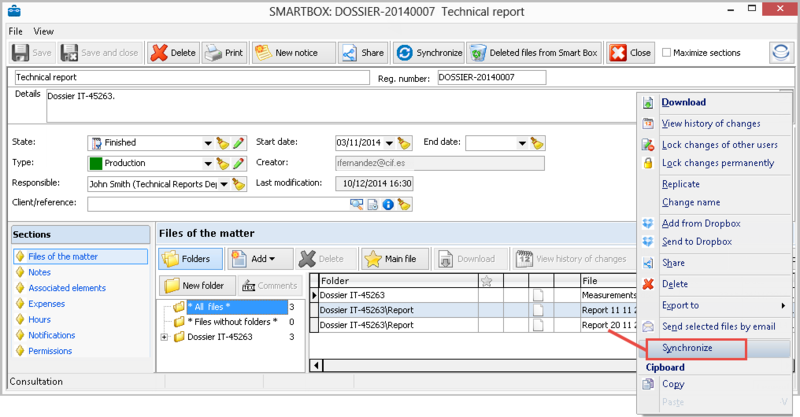 Files and folders added or edited in a DSB folder are automatically synchronized with CIFKM server. "My Documents" is a user's private storage folder in CIFKM Sync. In this folder user can save files and folders that are automatically synchronized with the equivalent folder in CIFKM server. It's a kind of user's private DSB which isn't shared and hasn't attributes. 15. 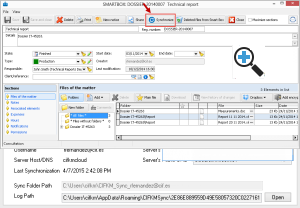 How to know if synchronization of a file, folder or DSB is activated and ready? You can see the icons that show sync status of an element in point 7 of this guide. Already sync elements in the "CIFKM Sync_(...) folder" show a green circle on their icon low-left corner and elements with sync. in process show a yellow circle on their icon low-left corner . A fully sync DSB in a CIFKM's window show this green label on its up-left corner, and a partially synchronized DSB show this split green- yellow label on its up-left corner. Fully sync DSB in the CIFKM's window of "Recent Smart Boxes" or on a "search result list" window show this blue icon and partially synchronized DSB show this split blue-yellow icon . If the DSB is fully synchronized, it is understood that all its items are synchronized, so that they don't show any sort of icon. Users can share and modify files in CIFKM, what means that several users could overlap file changes and provoke version conflicts. "CIFKM Sync" before starting a sync process warns the user if in CIFKM server is a later version than the one previously synchronized by the user. Keep in mind that the editing programs behave differently when a file is being used and somebody else saves a new version. For avoiding version conflicts, CIFKM has a check-out/check-in functionality which allows a user, with the appropriate rights over the DSB content, to lock temporarily a file for other user changes. The file is locked only for other users as long as check-out is activated. This warning appears at file version conflicts. Clicking on it a window pops up showing the affected files. Open DSB in CIFKM: It opens the window of the DSB in the CIFKM application. Open local file: It opens the file modified bu the user that could not be synchronized. Move local file: It allows to "save as" the modified file in another place. Delete local file: Deletes the modified file keeping the original one (without modifications). Permanent lock: Modification can't be uploaded to CIFKM server afterwards. Temporary lock: Only the user who locked the file can upload modifications to CIFKM server; other users aren't allowed until the check-in function is applied by the first user. Therefore, this user hasn't to worry about version conflicts. Users, through their Company's CIFKM Website, may access their authorised DSB by a web-browser. This way a user can perform DSB searches, and add, modify and delete files and folders at any DSB according to his rights over it. Besides, users have a shortcut to their synchronized DSB, files and folders, and to My documents without starting any DSB search.